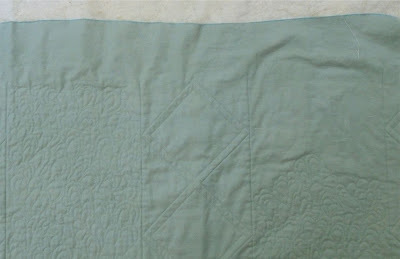 With summer here my quilting schedule seems to fluctuate between flat-out and nothing. After a not so relaxing, non-quilting week of vacation in Maine and another few days of catching up/recovering from said week in Maine, we had a horrible, cold, rainy Friday. I had planned to take the kids to the pool again but with that out they parked themselves in front of the TV and declared it movie marathon day. I've actually surpassed my quota for viewings of MegaMind so I snuck off to my quilt studio for some much needed quilt therapy. While I am in the middle of a few projects with so much time away I wasn't feeling particularly invested in any one of them and they were sitting with a stack of UFOs so I stared at those for a while also. 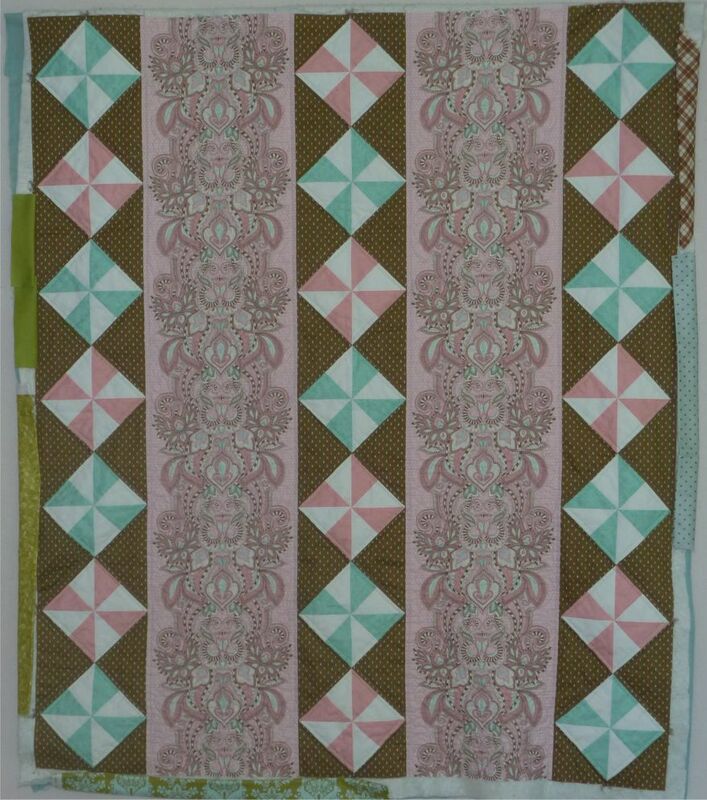 Last summer I'd pieced this top with Tula Pink Hushabye and started quilting it. 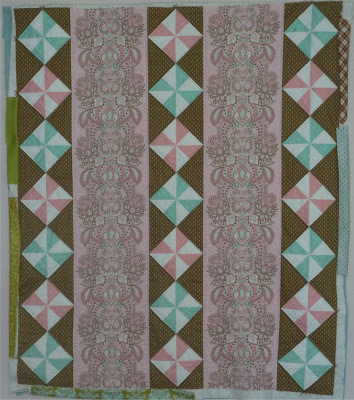 I wasn't happy with the quilting design and ended up ripping some of it out before tossing it in the "maybe later" pile. Way back in May at the BMQG meeting the lovely Lia brought her Hushabye quilt. 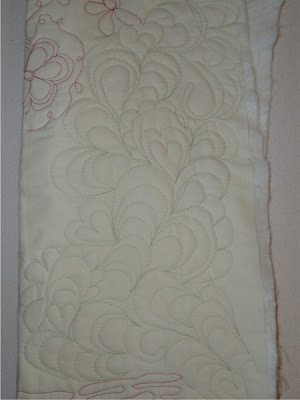 This was her very first attempt at FMQ and she invented a beautiful paisley design with hidden hearts. Her idea had been niggling around in the back of my mind and seemed like the perfect thing for quilting the owl stripes. I owe her a HUGE thank you for her inspiration!!! until I ran out of thread. So I pried the kids off the couch and dragged them off to our LQS which is so conveniently located only 7 minutes away. Even better, they've just opened an ice cream shop across the street. The better to bribe the kiddie's with: ) We got our thread and ice cream and I was ready to go for it. 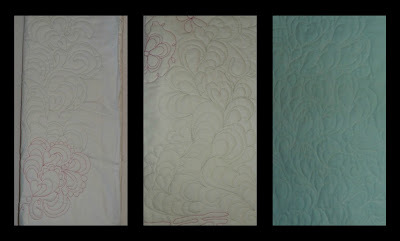 So I quilted... and quilted... and quilted. The first stripe was done and I could almost see the finish line on the second when I ran out of thread, again. 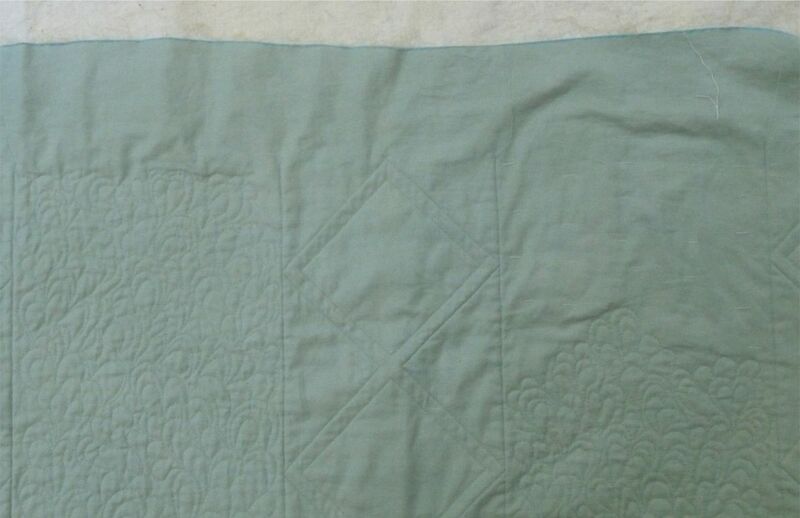 3 inches left to quilt and I run out of thread, probably a sign that it was time to go to bed anyway. Luckily that LQS is still only 7 minutes away so in the morning I was able to zip back over and get another spool of thread to finish. It's so important to support our local businesses! I often find myself buying online because it's cheaper and delivered directly to my door but it's situations like this that remind me how lucky I am to have a brick and mortar store in my village. I love how this came out! Now it just needs to be bound so I'll probably make yet another trip to my LQS tomorrow to choose a binding. I have enough of the brown raindrops but I'm still auditioning other options. I love binding quilts so I'm not worried this will return to the UFO pile for another year but it may have to wait for another rainy day. Very cool Alice! Can't wait to see it in person! I need to broaden my horizons with FMQ as well. Bummed I'm missing the sew in this week!